We’re up on Amazon! Please search for Bathroom Begonia and tell all your friends! December 14, 2012 – Information, inspiration and entertainment site My Daily Moment featured the Bathroom Begonia in their Diet & Fitness section. 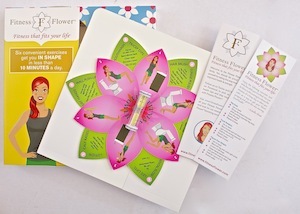 Fitness Flower launch party was a huge success! December 13, 2012 – Thank you to everyone who made it to Shore Fit! 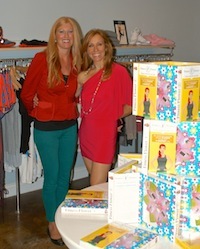 Here’s a picture of Shore Fit’s owner, Sarah Jeffries, and Estelle Shaw next to the Fitness Flower tower. We are in our first store!! November 17, 2012 – Shore Fit, 1012 Manhattan Avenue, Manhattan Beach, CA 90266. Come by and check out their cool workout wear and the Fitness Flower! August 1, 2012 – One of the best excuses for not working out is not having enough time. Like it or not, that excuse is no longer valid. Created by a fitness-minded and busy mother, the Bathroom Begonia teaches users how to make the most of their morning or evening bathroom routine. Through six different exercises that are paired with activities such as gargling with mouthwash and flossing, even the busiest can sneak in a body-toning workout. The Bathroom Begonia clings to any mirror and comes with an attached sand hourglass to time each exercise. The workout doesn’t end in the bathroom, though. Also included is the Reading Rose Bookmark, which contains six extra exercises that utilize the time between crawling into bed and falling asleep. And because it’s so easy to cheat during a workout, the Bathroom Begonia comes with a checklist designed to ensure users make fitness progress while using the Bathroom Begonia and Reading Rose Bookmark. The Bathroom Begonia is available for sale online at www.fitnessflower.com.